"In Chernobyl, no one knew how serious it was. We wore no special clothes. I am 55 years old and no one needs me. I can still hold a spoon but I need help to go the bathroom and I have to wear diapers." Budkovskiy, a mailman from Ivankiv, Ukraine, delivered top-secret mail to the military HQ in Chernobyl town. He continued for four years out of a sense of duty. His legs slowly stopped working, and by 1996 he was confined to a wheelchair. His grandson Slava helps him move around. 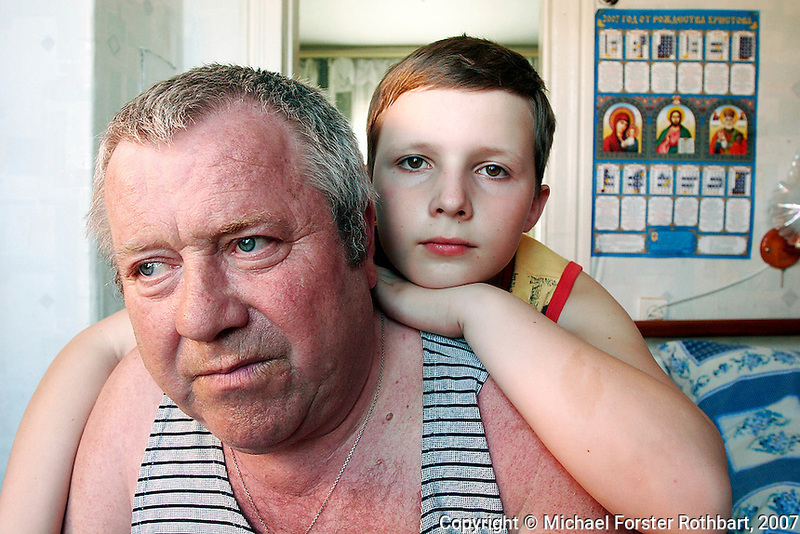 Photo title: Leonid Budkovskiy with his grandson Slava. Caption: In 1986, Leonid Budkovskiy, then a mailman in Ivankiv, was reassigned to deliver top-secret mail to the military headquarters set up in Chernobyl town. He continued for four years out of a sense of duty, even after the four drivers he worked with all quit. His legs slowly stopped working and by 1996 he was confined to a wheelchair. ..Currently, Budkovskiy spends most days sitting on his back stoop, overlooking his wife's vegetable garden, getting help from his grandson Slava and other family members. ...Quote: . "In Chernobyl, no one knew how serious it was. We wore no special clothes. I am 55 years old and no one needs me. I can still hold a spoon but I need help to go the bathroom and I have to wear diapers. ".-- Leonid Budkovskiy, Chernobyl liquidator.-------------------..